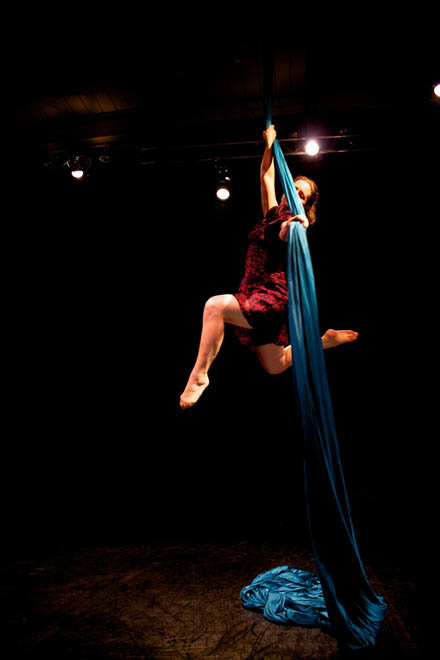 Lauren Breunig is an aerialist and acrobat with a versatile repertoire and dynamic presence on stage. Her many years of performance as a musician have had a strong influence on her as a circus artist--she dances through the air on her original apparatus, the Sliding Trapeze, as well as solo and duo fabric/silks, static trapeze, aerial sling/hammock, and slammock (silks combined with hammock). With performances that are highly technical yet fluidly graceful, Lauren will add spice and magic to any event as a feature act or as ambient entertainment. She is also available for partner acrobatics. Lauren exceeded our expectations for our event!! Our guests have not stopped talking about it! This was our 10th Annual Party and all we have heard is that it was our best! Thank you so much! Can't wait to work with you again in the future! Lauren Breunig is one of the most talented aerialists and acrobats I've had the pleasure of working with! She does an amazing performance, works VERY professionally, and is always early for her shows. Every time I hire her she surpasses every expectation I have of her and she blows my clients away! She's definitely someone special to work with. Grace and athleticism combine in Lauren's fluid performance style. 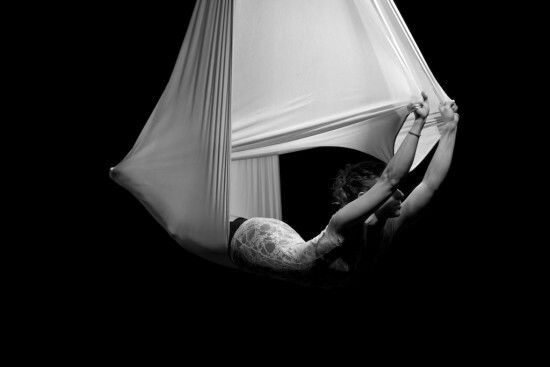 Whether she is flying high on the fabrics or winding her way through her unique apparatus the Sliding Trapeze, you will be captivated by her movements and energy. Lauren Breunig fell in love with circus while working as a counselor at Circus Smirkus summer camp. That love drew her to study with social circus organization El Circo del Mundo in Santiago, Chile, during a semester abroad in college. She was so inspired by the transformation and empowerment she witnessed that she decided to pursue circus herself. After college, she landed in Brattleboro, VT and began taking classes at the New England Center for Circus Arts (NECCA), first as a recreational student and then as part of NECCA’s professional training programs. At NECCA, she has worked with world-class coaches from Cirque du Soleil, Cirque Eloize, Ringling Brothers, and Pilobolus. She has taught aerials and acrobatics to youth and adults at studios and camps across the country, including NECCA, Circus Smirkus, Center Ring Circus School, Tucson Circus Arts, Circus School of Arizona, and Altitude Aerials. As a circus artist, she has delighted audiences large and small with performances on her original apparatus, the Sliding Trapeze, as well as aerial sling, solo fabric, duo fabric, and in partner acrobatics. In 2013, she appeared on her Sliding Trapeze as a featured Innovative Aerialist at the Aerial Acrobatics Arts Festival of Denver. A veteran of the stage as a singer, Lauren has toured and recorded in the US and Europe with a variety of folk music groups including Northern Harmony, the Renewal Chorus, and her band, Windborne. In January/February 2014, Windborne toured with the prestigious American Music Abroad program, sponsored by the US Department of State's Bureau of Cultural and Educational Affairs. Acting as cultural ambassadors, they traveled to Turkmenistan, Kyrgyzstan, and Angola, giving workshops, presentations, and concerts. She is currently based in Brattleboro, VT and is available for travel nationwide. -points must have minimum height of 18 ft.
-for fabric: ideal working height 20-25 ft, can work higher or lower as needed. -for static trapeze: two rigging points must be 30-33 inches apart. Ideal working height 18 ft, can work higher as needed. -for sling: any height can work.